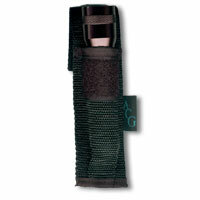 Flashlight Pouch Designed For Maglite, Scorpion, Twin-Task or Surefire. Compact pouch made of super durable nylon webbing. Designed to carry a Scorpion, Maglite or Surefire flashlight. Dimensions: 5"H x 1.75"W x 1.5"D.